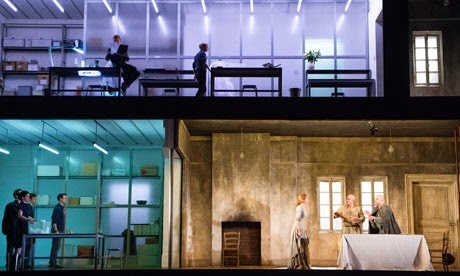 Part I of the Barbara Hannigan film festival is Written on Skin, an opera by George Benjamin based on a tale from the Decameron by Boccaccio. It was recorded at the Royal Opera Covent Garden March, 2013. A constant presence in the story are angels from the 21st century. I'm sorry. This can't be Boccaccio. It isn't about tattoos either. It is instead the flaw in theology. God writes a story on our bodies and we are forced to live it. I am sitting here by the screen shouting "Kill him." That certainly never happened before. She doesn't. She never does, it seems. We are what he has written us to be. She shouts that the taste will never leave her and a glass harmonica plays. Even Lucia's glass harmonica is not so frightening and strange. It doesn't seem suitable to criticize this. It is abstract, profound, much more than I imagined it could be. See it for yourself. I recommend the DVD so you can follow along with the text.